A climber who was rescued after going missing on a mountain in the Highlands has died. The 57-year-old was airlifted from Stob Coire nan Lochan, part of the Three Sisters ridges in Glencoe, on Saturday. He and another climber, 49, were found at about midday, both with hypothermia, after they were reported overdue from a climb the previous day. Both climbers had travelled to the Glencoe area from Nottinghamshire as part of a larger group. 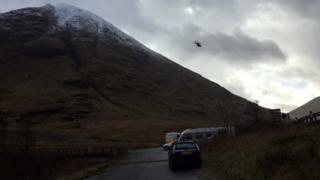 The other climber is at Belford Hospital in Fort William and described as stable. The men were found following an extensive search involving police, HM Coastguard and mountain rescue teams. The two men were located with assistance from members of the public at around lunchtime on Saturday. They were taken to hospitals in Aberdeen and Fort William. The man’s next of kin have been made aware. The risk of avalanche in Glencoe on Friday and Saturday was rated “considerable” by the Scottish Avalanche Information Service (SAIS), particularly at corrie rims, gully tops and steep slope tops. A SAIS report warned that conditions would “remain wintry and unsettled” for a few days.